It might not be long until Snapchat’s business model fades as its messages do. In about eight months, Instagram Stories, the function of Facebook’s image-sharing social network that allows users to post images and short videos that disappear after 24 hours, has amassed 200 million daily users, it announced today. That’s more than the 161 million users that Snapchat, which pioneered the daily story feature, has attracted in the five years the company has existed. Snap, the parent company of Snapchat which debuted on the New York Stock Exchange in February, wasn’t immediately available to comment on how many daily users it has now—the last reported figure was accurate through Dec. 31, 2016. 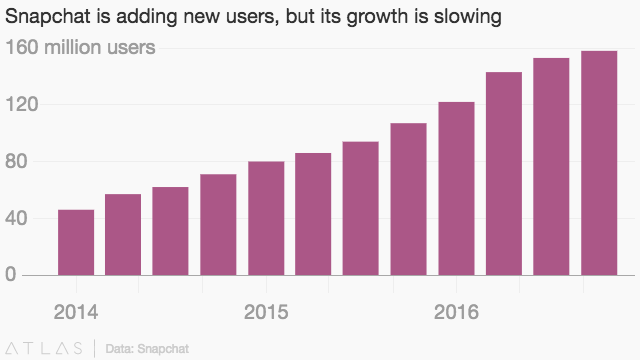 But in Snap’s IPO filings, it revealed that user growth had slowed in recent quarters, and it’s very likely that Instagram’s copying of one of its main features has not helped it attract new users. It’s not clear what Facebook’s assault will have on the newly public Snap. But Facebook’s ability to quickly (and legally) copy any feature Snapchat has and send it out to upwards of 2 billion users at any given time was always likely to be a real concern for Snap’s long-term health. The vast majority of Snap’s revenue comes from advertisements on Snapchat, and a large slice of that comes from the video ads it shows between Stories. If that money dries up because its users switch to Facebook, and Snap hasn’t found something to replace it with, the company may well struggle to survive. At the time of publishing, Snap’s stock price was down roughly 1.5% on the day, to $20—only about $3 more than the original IPO price, and below the $24 price it debuted on the market.